Need An Extra Large Storage Space? Tuff Shed has your solution! During a trip to the Home Depot (HD) for a backup generator, Allen Meyer mentioned to an HD Sales Associate that he was in search of an extra shed or garage. He was put into contact with Tuff Shed Area Sales Manager Sonny Kollmorgan. Later that day the two met and discussed Allen’s storage needs. After a bit of discussion and planning, Allen decided on a 30×40 Sundance Series garage. He upgraded the garage’s wall height to 10ft, added 2×6 studs, and raised the roof pitch to 12×12 with attic trusses. In addition, the garage has an 8×16 front porch, carriage garage doors, two-tone wainscoting exterior paint, and a half loft inside with a set of stairs. 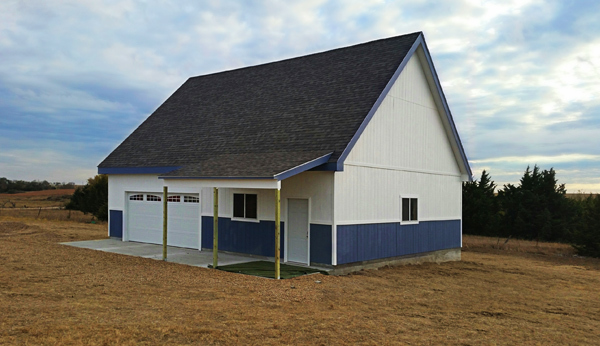 Allen plans to use half of his new Tuff Shed garage for storing farming equipment, tractors, 4-wheelers, and pickups. The other half of the garage will be insulated for a workspace. The insulated section will also be home to a golf-simulator to keep his game strong during the winter. Meyer is finalizing the wiring for the electrical work in his workshop and will begin insulating when he’s finished.